I'm here with my design team project for The Rubber Buggy. Did you know a lot of the products can be used for pocketed scrapbooking? I'm trying Ali Edwards concept of documenting an entire day in your life. You can find her approach to it HERE. 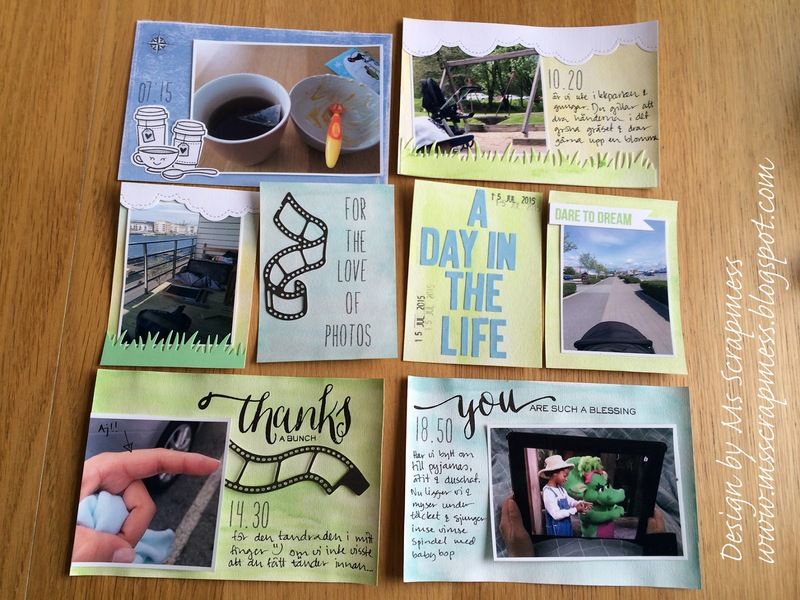 I love her ideas for documenting and preserving memories and thought I give it a go. But I downsized it quite a bit. I used Lawn Fawn's ink to watercolor with and made my own set of pocketed cards. The exception being my 4x6 card that I made from a Maja Design 6x6 paper. The rest is really easy peasy with such great products. I played some with Love you a latte and put some coffee cups next to a photo of our breakfast. With the alpha stamp & die set from Lawn Fawn I can put together whatever sentiment I wish to. But there are great sentiments in the set from Wplus9 aswell. I used the sentiments "Thanks a bunch" for the teeth marks I got in my finger and "You are such a blessing" for night time.